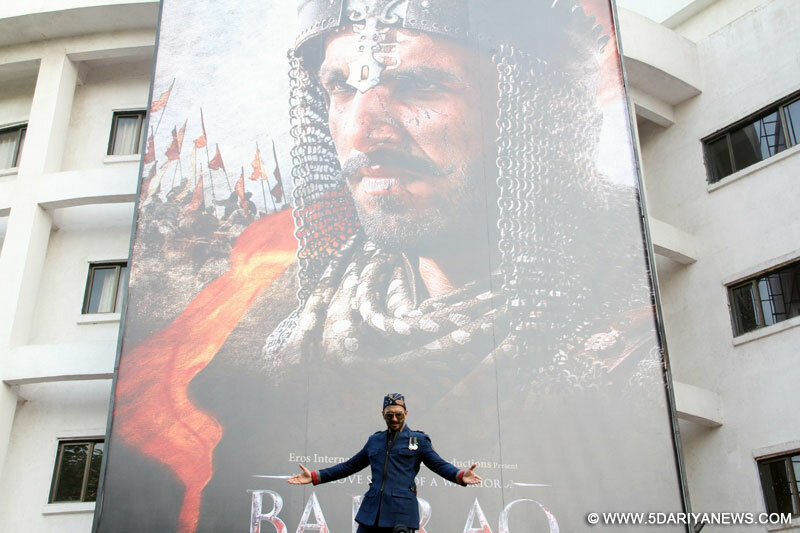 The makers of "Bajirao Mastani" have unveiled a 60-ft poster of Bajirao played by Ranveer Singh in the movie. After revealing bits and parts of the magnum opus, Ranveer and filmmaker Sanjay Leela Bhansali unveiled the solo poster of Bajirao in a larger-than-life fashion here on Wednesday.A period drama, "Bajirao Mastani" features Ranveer Singh as the 18th century Maratha warrior Peshwa Bajirao I, Deepika Padukone as Mastani and Priyanka Chopra as Bajirao's wife Kashibai. The sets, costumes and exuberance seen in the movie's trailers and songs spell grandeur. "'Bajirao Mastani' has been a longstanding dream of Sanjay Leela Bhansali and I'm honoured to be part of something he feels so passionately about. I'm truly touched that Bhansali has put his faith in me with this film.